We cordially invite you to La Luz Inaugural Strong & Courageous Gala. The event will include a dinner, live music, silent auctions and our Keynote Speaker Rosie Rivera. All benefiting La Luz Org services for Latino victims of Domestic Violence and Sexual Assault. 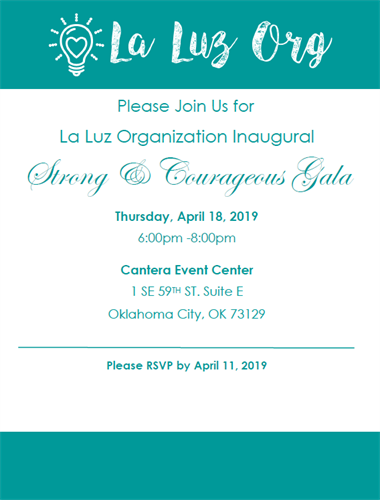 Contact Please return form to Raquel Rodriguez at the La Luz Org at gala@laluzokc.org or 552-1043 with questions or to confirm your sponsorship of Strong & Courageous Gala 2019 today!